Jailed political activist Nadezhda Tolokonnikova, who has been sentenced two years at a labor camp for hooliganism charges after her arrest in March last year, has entered a plea for an early release after multiple instances of health complications caused by hours upon hours of forced labor. Tolokonnikova complained of persistent headaches after extensive work, like sewing 320 jacket linings per day in the camp. The Russian court is to consider her early release, though prison officials are adamantly against her release. Claiming that she is "decisive, insensitive to ethics and conscience and thinking only about herself," adding that she once did not greet a prison official while she was in the hospital and refused to go on a walk once. Clearly, Russian prisons are a place of compassion. 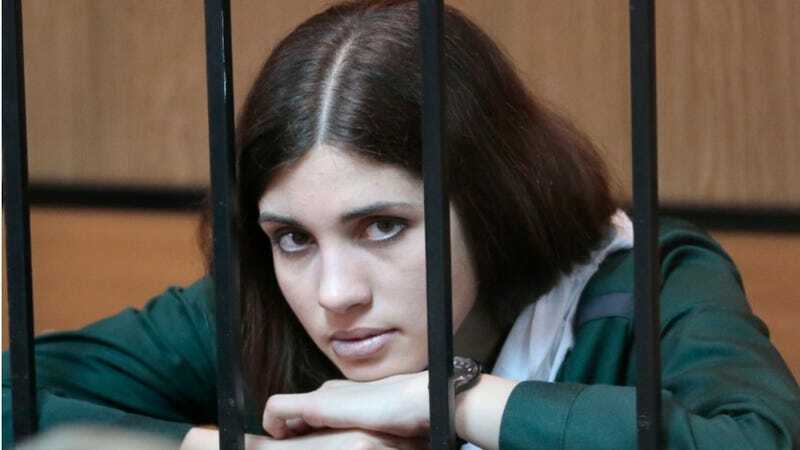 Tolokonnikova, whose defense team argued her early release would benefit her five-year-old daughter, is only six months into her sentence. Her bandmate Yekaterina Samutsevich was released on appeal last year.